Characterized with a copious number of key players, the global roofing market is highly fragmented and competitive in nature. In this scenario, to maintain their market share, top players are aggressively engaged in research and development to introduce novel roofing material that are stronger and inexpensive. However, development of bio-based or green roofing and solar roofing materials is the focus of topnotch players, which are gaining adoption to serve environmental and energy conservation needs. Furthermore, in an intensely competitive market, players are seeking alternative growth strategies to sustain competition. Some players in the roofing market are engaged in producing raw material as well as roofing material, which features backward integration in the manufacturing value chain. This helps players to control quality and cost which adds to their competitive advantage. Support from several governments for companies that are striving to offer clean and green roofing solutions is likely to attract new players in the market. This is likely to intensify competition in the future. As per estimates of a market intelligence study by Transparency Market Research (TMR), the global roofing market is likely to post a CAGR of 6.5% between 2017 and 2024. Growing at this pace, the market’s valuation of US$80118.6 mn in 2017 will become US$124501.8 mn by 2024. Among the key product segments, bituminous roofing accounts for almost 50% of the overall market. Low cost, easy installation, and long durability of bituminous roofing accounts for its large market share. Application-wise, residential is anticipated to hold significant share of the market vis-à-vis revenue. However, non-residential is the leading application segment of the roofing market due to increase in construction of commercial buildings and hotels in both developed and developing countries. In terms of region, Asia Pacific generates leading revenue in the roofing market due to massive surge in construction activities. Majorly fuelling the roofing market is growth of the construction sector worldwide. Developing countries in Asia Pacific, Latin America, and Africa that are undergoing rapid industrialization and urbanization are providing ample opportunities to the growth of roofing market. Construction of commercial buildings such as multiplexes and shopping arcades in response to the changing lifestyle of people is also serving to boost the roofing market. Moreover, government residential projects in developing countries to serve the housing needs of large economically weak population is also benefitting the roofing market. Developed countries in North America and Europe are also serving to benefit the roofing market. Initiatives for construction of green buildings is generating demand for roofing materials. Energy conservation initiatives leading to renovation of old buildings involves supplanting old roofs with new ones. This is benefitting the roofing market in developed countries. Proving to hinder the growth of roofing market is increase in production cost of roofing material. Challenges pertaining to maintaining quality and availability of asphalt, which is a major raw material in the manufacture of bituminous roofing material is escalating the price of final product. This is negatively impacting the growth of roofing market. Furthermore, increasing cost of manufacturing processes of roofing materials is hampering the roofing market. 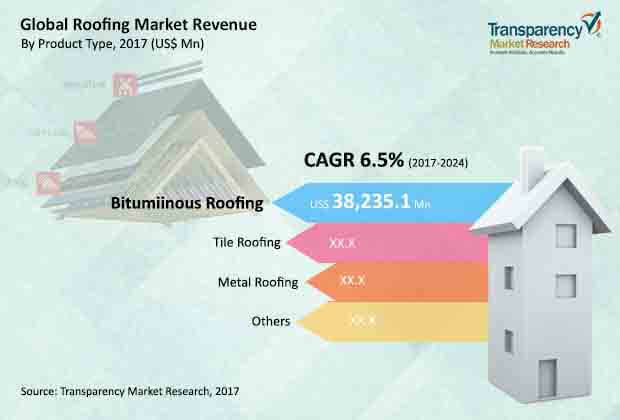 However, with advancements in techniques for production of roofing materials and economies of scale are likely to provide ample growth opportunities for players in the roofing market.